Waterfalls create a feeling of serenity, a sense of restrained power. Their grandeur takes our breath away. Their gentle sounds complement periods of meditation. Well over 500 waterfalls decorate the scenery across Virginia and West Virginia, from Dark Hollow Falls in Shenandoah National Park to the Falls of Hills Creek in the Monongahela National Forest. This revised and updated guidebook covers more than 100 of the most beautiful and impressive among them. Organized geographically and ranked by beauty, Waterfalls of Virginia and West Virginia makes it simple to find the best waterfalls in each state, as well as the ones nearest you. The informative guidebook by Randall Sanger features all the information you need, including directions, distance, hike difficulty, and more. Professional photographs of every waterfall are paired with important details, including height, photography tips, and the best time of year to visit. A curated look at the locales, including not-to-miss sights and activities on-site, as well as things to do in the surrounding area, make this your essential guide to seeing the best waterfalls in Virginia and West Virginia! Randall Sanger is a landscape photographer, workshop instructor, and author. Through his photography, his ultimate desire is to glorify God’s creation, showcase the natural beauty of West Virginia, and inspire others to preserve and protect the many special places found in the Mountain State. For over 20 years Randall has been traipsing about West Virginia in search of grand vistas, majestic waterfalls, and intimate forest scenes. 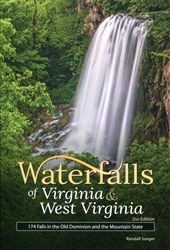 Randall is coauthor of the multi-award-winning book West Virginia Waterfalls: The New River Gorge, and he’s currently working on several additional titles. Randall conducts photography workshops throughout West Virginia and beyond. His images have appeared in print and digital publications, are in private and corporate collections, and have been used for various marketing campaigns. Randall was selected as Photographer in Residence for the Canaan Valley National Wildlife Refuge during the summer of 2010. He’s a Juried Fine Arts Photographer with Tamarack: The Best of West Virginia, located in Beckley, and his work can also be viewed at the Buxton and Landstreet Gallery in Thomas, West Virginia. Randall resides in Williamson with his wife, Melissa, their daughter, Hannah, and his trusty hiking companion Rocky, their mixed-breed dog.